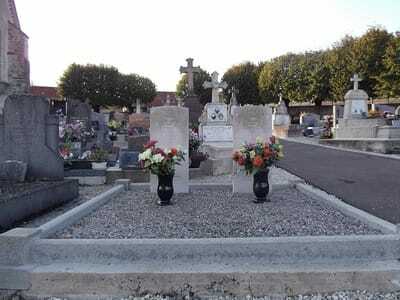 Vitry-le-Croisé is a village and commune 41 kilometres east-south-east of Troyes, and 16 kilometres south-west of Bar-sur-Aube, a town 50 kilometres east of Troyes. 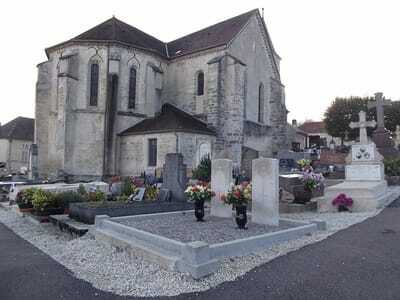 Near the eastern wall of the churchyard are the graves of two airmen from the United Kingdom. 1892578 Sergeant Edwin Ashton, Air Gunner in 166 Squadron, Royal Air Force Volunteer Reserve, died 13th July 1944, aged 19. Son of Henry and Gertrude Emma Ashton, of Rainham, Kent. 1392909 Flight Sergeant Reginald Patrick Scott, Wireless Operator in 166 Squadron, Royal Air Force Volunteer Reserve, died 13th July 1944, aged 20. Son of Herbert William and Phoebe Scott. Awarded a Junior County Scholarship.